The illustration shows the bottom view of the server with an example floor cutout. This example cutout extends under the server to provide a generous bend radius for the cables and power cords. Depending on your raised-floor cabling requirements, your data center might require a different cutout. Contact your facilities manager for more information. 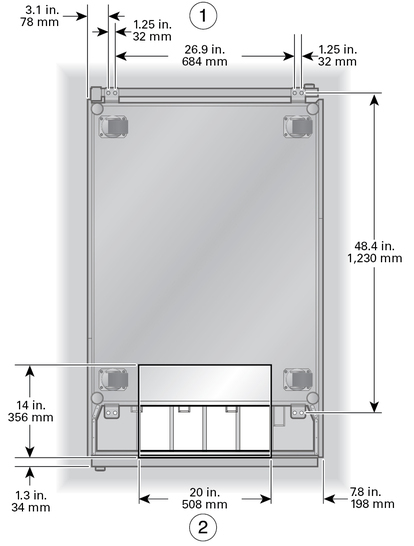 The mounting hole dimensions are for optional mounting brackets. See Install the Mounting Brackets for instructions. Caution - If your floor cutout is near the leveling feet or mounting brackets, ensure that the surrounding floor tiles can support the weight of the server. See Raised Floor Weight Considerations for more information. Caution - Be careful when moving the server near floor cutouts. If the server's casters fall into a floor cutout, the floor and the server could be severely damaged.